Now in a big bowl mix the sausage mince with the sauces, slice bread, chopped coriender and salt and pepper. Now divide this mixture into 8 equal portions. Dust eggs lightly with flour than cover each half boiled egg with the sausage mixture ,press well. 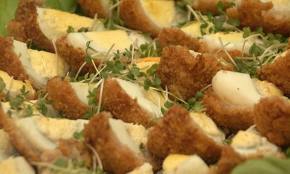 Brush the beaten eggs and roll the eggs in bread crumbs. Then deep fry the eggs in hot oil until golden brown, drain on paper towels. Now cut each of them into half and serve hot with dip or sauce of your own choice.